Amazing Location close to the waterfront and City Central! Comfortable Spacious studio with fully equipped pentry and bathroom. The studio is newly renovated, bright and has got a hotel-like feeling. It is tastefully decorated with scandinavian furniture and has a solid wood floor. The studio is a perfect stay for both solo and couple travelers as well as for business travellers who want to stay for a longer or shorter period of time. The Studio has a fully equipped kitchen with hob, fridge and kitchen utensils, pots and pans and plates/cutlery. All essentials for guests to make own food during the stay. The bathroom is rather spacious with a WC, sink and shower. The bed is 160 cm wide, a king size. High speed WIFI Internet is provided along with essentials such as a Clothes Iron, Ironing Board, Hair Dryer and Cable TV. Self-service Laundry facilities are available on site and can be booked. The street it self is calm (even if close to the more busy streets) and there is parking available on the street.There is an elevator in the buildning. The laundry room, located in the basement, is fully equipped with two washing machines, driers and a drying cabinet. If you need to wash clothes during your stay I have left some instructions on how to use the machines. The property is situated on beautiful and calm street Hjärnegatan - close to City central and vibrant street Flemminggatan. The area is green with parks and close to the waterfront and the City hall. The apartment is newly renovated and repainted, is bright with large windows and got a hotel-like feeling. Location is key and the studio offers both closeness to parks and waterfront as well as being close to the city central and connections to rest of Stockholm. The perfect location to explore Stockholm from! The bathroom has white tiled walls and floor with a WC, sink and shower. 10 minutes walk from the Studio is the waterfront and a nice walk around the City hall. To walk along the water to Gamla Stan (Old town) takes about 20-30 minutes. Small dining place for two. The kitchenette is fully equipped with a hob and fridge, kitchen utensils, pots and pans and plates/cutlery. All essentials for guests to make own food during the stay. The apartment is tastefully decorated and well suited for you travelling alone or in company of two, both for business trips or exclusive stay by yourself. The kitchenette enable you to cook your own food if you don’t feel like eating out all meals. 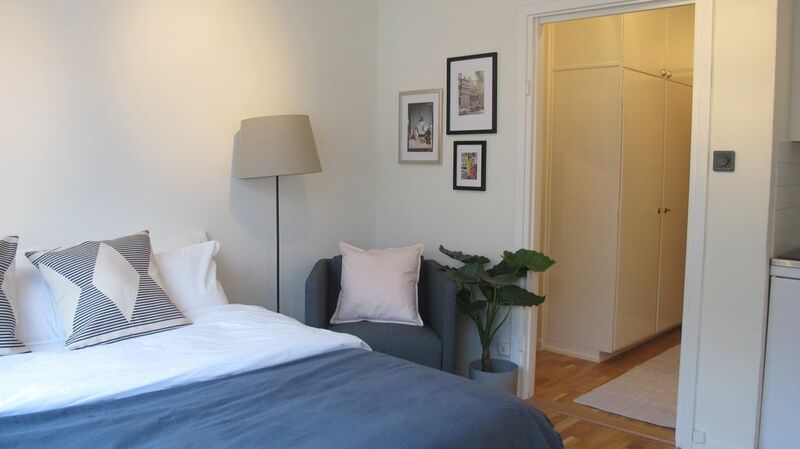 This studio is located in the central yet calm part of Kungsholmen; close to both City central, the waterfront restaurants and bars. The metro station “Rådhuset” is just 5 minutes walk from the apartment (Blue line) or you walk to T-centralen (Central station which is a bit further away about 5-10 minutes walk. The location is central to the whole of Stockholm: if you go one stop on the redline towards “Ropsten/Mörby centrum you end up at vibrating Stureplan and Östermalmstorg; if you go two stops you reach the Karlaplan and the Royal Djurgården with the Vasa Museeum, Skansen, the Abba Museum and the amusement park Gröna lund. If you take the Red or Green line in the opposite direction one stop you reach Old Town and if you go two stops that direction you reach Södermalm. If you prefer to walk, the apartment is nicely situated in an area green with parks and it is also close to the waterfront.